So I wasn't expecting anything to happen until at least Monday/Tuesday the following week. I was, however, pleasantly surprised to find an email in my mailbox stating my server was ready by 20:15 the same day. Less than 16 hours to provision a custom server and at the weekend. Pretty impressive. Logging into their control panel, I was presented with the two methods for accessing the server, a web interface to connect to the server via Dell's iDRAC management card, and a second login address to connect to via the v-sphere client. I reviewed the config over the iDRAC connection, it's a pretty typical remote management interface showing server summary, along with a remote KVM utility. Shouldn't be something I need to use much as most tasks should be able to be accomplished via VMware. 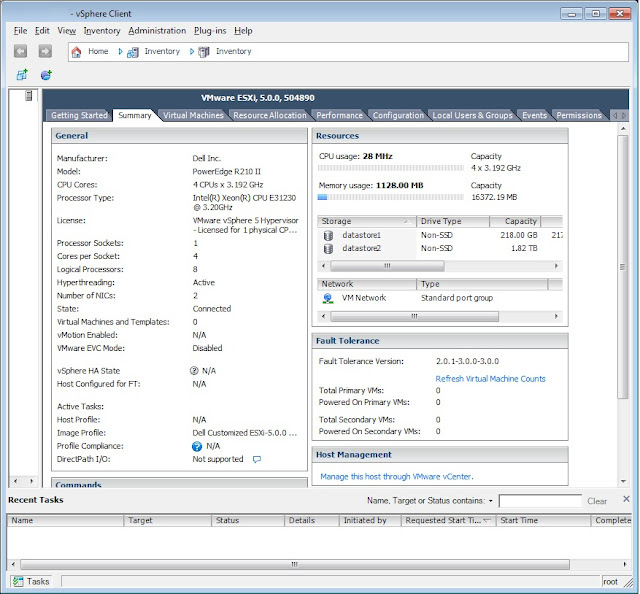 Accessing the VMware management interface I was presented with the link for downloading the vSphere client. Download and installation was quick and went without a hitch and I was now accessing the server via the standard VMware client. I reviewed the specification and configuration. All appeared correct as per the order except I wasn't seeing the 2TB SAS drive. I raised a ticked via the Redstation control panel, and an engineer was quickly assigned who advised it looked like the drive had been missed in the build. After confirming I was happy for the server to be rebooted the drive was installed and the issue was quickly resolved. One concern I had with the order was would the two management interfaces be on addresses from my pool of 4 IP's. I was pleased to learn this wasn't the case, I'm sure many hosting providers will provide say 4 IP's but then deploy a config that uses a number of them, limiting how the pool can be used. I was now in possession of a server whose hardware build was complete and could now start looking at my software deployment.